Self-Closing Bent Nose Tweezers. 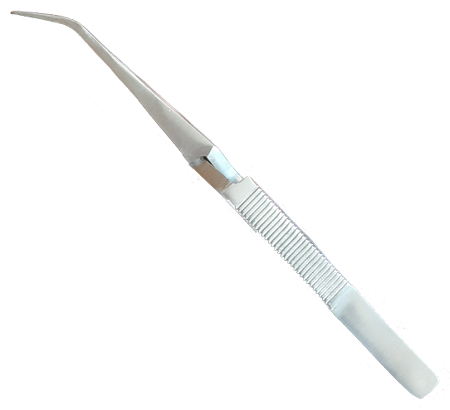 This is another one of the special tweezers we offer. They hold the bee so you don't have to. Perfect for Bee Venom Therapy, they work in reverse. When you squeeze them they OPEN when you don't squeeze they grip the bee so you can place the bee where you need to sting. The blunt tips are aligned and the tension can be adjusted to the desired pressure. 6 1/2" long. These tweezers make it much easier for bee placement in Apitherapy....I needed to loosen the tight grip when they first came by clamping them around a pencil. But they work well. Thank you. These are much better than what I got from Ebay. I use these for live sting therapy. I do wish that with tweezers, there were a way to adjust them so they didn't grip so hard on the bee. I stretched these, and I put in spacers. I thought they were adjustable. Still they are better than the ones on ebay. Good service and seller. I'm rating it 3 stars only due to tightness of tweezers, but that is how these are meant to be for other projects. My hope is it will cause a change in style for the future. I like the tweezers they work quite well. A few were a bit strong in other words would crush the bee if left alone. But it's a simple fix.